Leverton didn’t seem to share her discomfort, since his arousal apparently hadn’t decreased at all. She had some knowledge of the male physique, from personal experience and observation of ancient statuary. If Leverton was not an anomaly, she was going to have to revise her understanding of the general dimensions of the male appendage. Finally, he pushed up a bit, which nudged his erection against a certain delicate spot. Gillian couldn’t hold back a tiny squeak. “Then get off me at once,” Gillian ordered in a low voice. “Right.” He sounded rather sheepish, as he should. But when he quickly rolled off her, Gillian had to stifle an instinctive sigh of regret. There was little doubt she was suffering a bizarre form of insanity. Leverton had snuck up on her, squashed her, and generally treated her like a totty-headed female. And yet all she wanted to do was pull him back down, wrap her arms around his broad shoulders, and kiss him senseless. Read the FIRST 6 CHAPTERS FOR FREE! click on this postcard. TODAY’S REVOLVING BOOK is the historical romance MY FAIR PRINCESS by Vanessa Kelly. NEW RELEASE! #REGENCY! TODAY’S REVOLVING BOOK IS THE western (historical) romance WIDOW WOMAN by USA Today bestselling author PATRICIA McLINN. Nick Dusaq’s painful past has kept him apart from people, until the day he signs on at the widow Terhune’s Wyoming Territory ranch. But Rachel Terhune is like no widow woman the Texas cowboy has encountered before. Rachel’s every thought is devoted to her ranch and the people who work it, until the day she sees Nick Dusaq rising naked from the creek like some ancient river god. Now the passion that flames between them threatens to destroy them both. Released today! WHERE LOVE LIVES: THE INHERITANCE, Book 6 in USA Today bestselling author Patricia McLinn’s Wyoming Wildflowers series. One night changed them both forever. . .
WHERE LOVE LIVES: NEW RELEASE! Six years ago, rodeo cowboy Matt Halderman ran out on a spunky, wide-eyed student he’d just met. Now he’s found that a chance meeting with an eccentric billionaire has resulted in an inheritance that will allow Matt to do something he’s long dreamed of – caring for rodeo horses at the end of their lives. Zoe Parisi hasn’t forgotten Matt or the night he walked out on her. She lost her head that night, but it’s been squarely back on her shoulders ever since. A doctor now, she is on track to take over an established practice in Knighton, Wyoming. She’d been sure when she decided to settle in Knighton that Matt would never return to the ranch where he grew up. But now, here he comes, waltzing back into town … looking just as good as ever and with a bunch of money. WHERE LOVE LIVES: The just-released Book 6 of Patricia McLinn’s Wyoming Wildflowers series, “Where Love Lives,” also is part of The Inheritance, a 12-author project that tells how eccentric billionaire Harold Hopewell’s bequests affect the life – and loves – of 12 people he chanced to meet. Each book is told in the author’s style, from sweet romance to mystery to erotica. In “Where Love Lives,” Zoe and Matt tussle over the best use of Hopewell’s bequest to the rodeo cowboy. But a deeper question looms: Will one night stand in the way of their spending the rest of their days together? TODAY’S REVOLVING BOOK is the western contemporary romance WYOMING WILDFLOWERS: THE BEGINNING. (Prequel to the Wyoming Wildflowers Series). FREE BOOK! 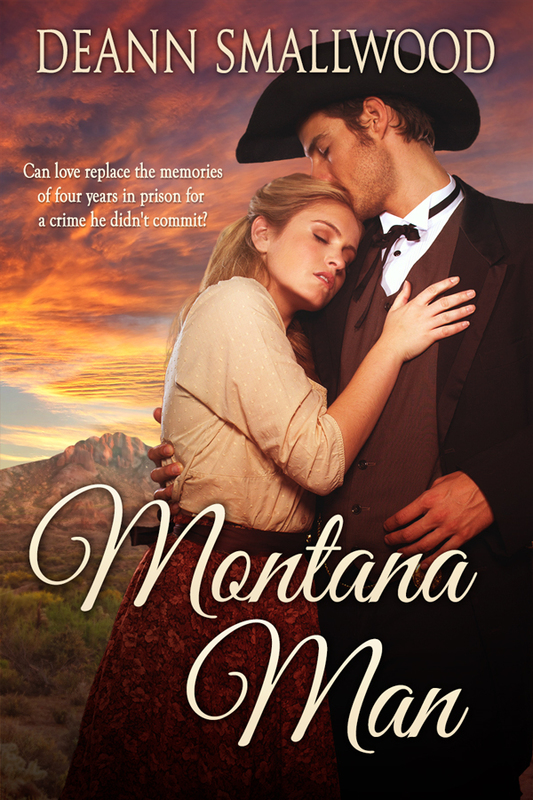 Today’s REVOLVING BOOK is the historical western romance MONTANA MAN by DeANN SMALLWOOD.